So you want to add your custom registered domain name in your Google App Engine project for free. You can point your domain name in your GAE very easily. In my previous post on GAE I showed you How to host your website on Google App Engine for Free. You can host your website on GAE for free with some limitations like you'll not be able to create PHP database and user name, bandwidth is limited to 1 GB per day. You can read more about the limitations here. But after creating your website, you will need a custom domain name and than you after buying your custom domain you have to setup everything yourself. In this post I will show you how to setup custom domain name in Google App Engine for free. Many of you may be facing a little problem on adding your own custom domain on your App engine project. 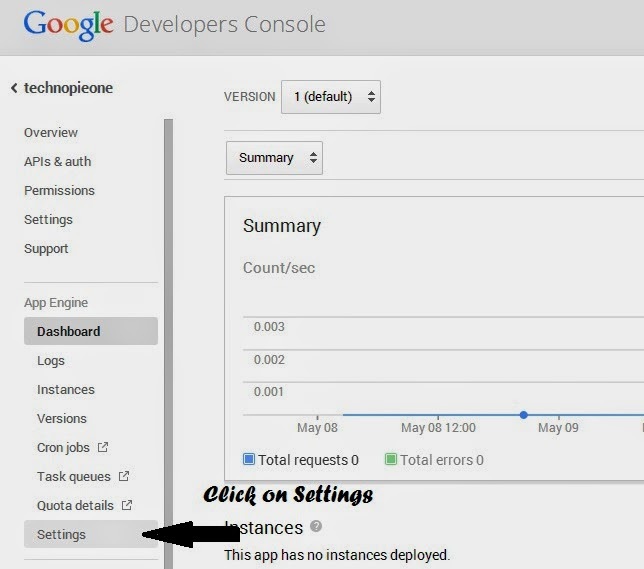 If you have a Google Apps account than you can do it very easily using App Engine Dashboard. But Google App is no more free and to setup your domain from Google Apps you have to pay a little price. But don't worry as there is a free way to setup your custom domain on your GAE project. It means you will not need to pay for Google Apps. Now see the very simple steps shown below. First of all go here. 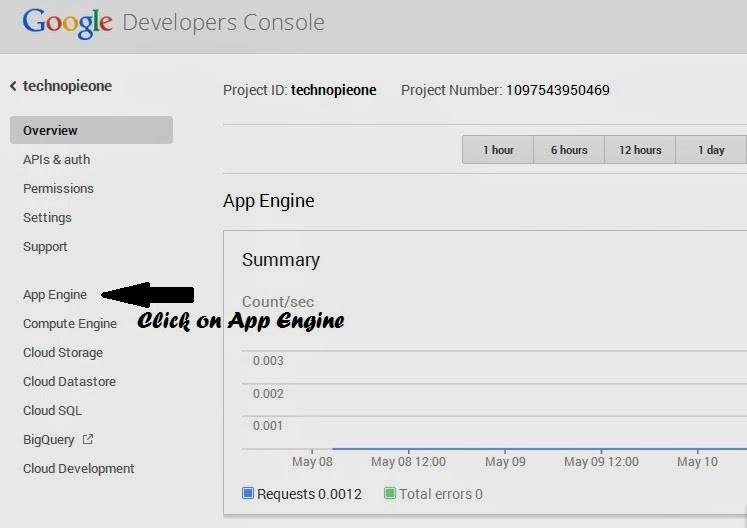 On that page, you will see all yours App Engine Projects. Now click on the project on which you would like to add or point your custom domain name. After clicking on your GAE project you will see the overview of your project or site. After that click on App Engine from the left sidebar. You can see the screenshot given below. After clicking on App Engine, click on Settings from the left sidebar. In the settings menu you can setup your custom registered domain name. But you will have to verify your ownership of that domain name. Just add your domain name and click on verify. 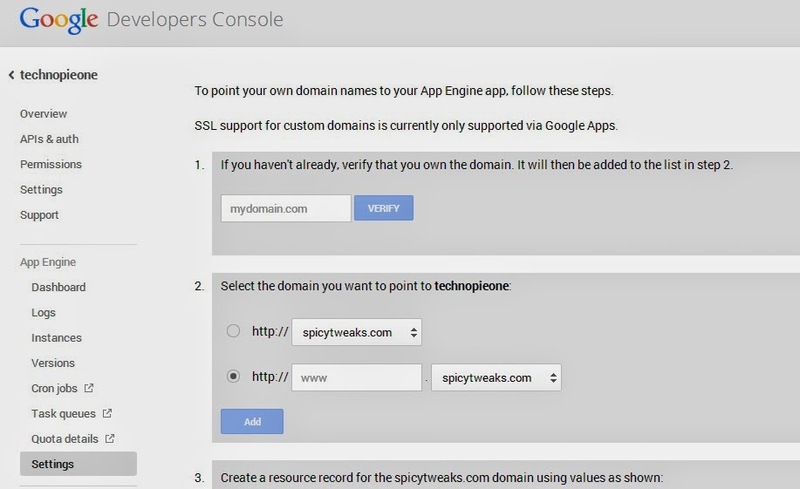 After verifying your domain name you can choose that domain name in your Google App Engine in the second step. You can host your App Engine project on a sub-domain. Just add the domain you want to point to your App Engine project. After adding your domain name you have to create a CNAME record. To create a CNAME record sign in to your Domain registrar account, than go to settings > DNS System and after that add a CNAME record with host or alias as your desired sub-domain prefix (for eg. www) and canonical name or point to as ghs.googlehosted.com. If you want the SSL support than you have to register for a Google Apps account. But if you don't need any SSL support than it will be perfect for you. Note: It can take sometimes for the DNS changes to take affect. Make sure you have created everything correct. You would also like to read Some Interesting Google Tricks.